What’s going on when I see little birds going after a big bird? 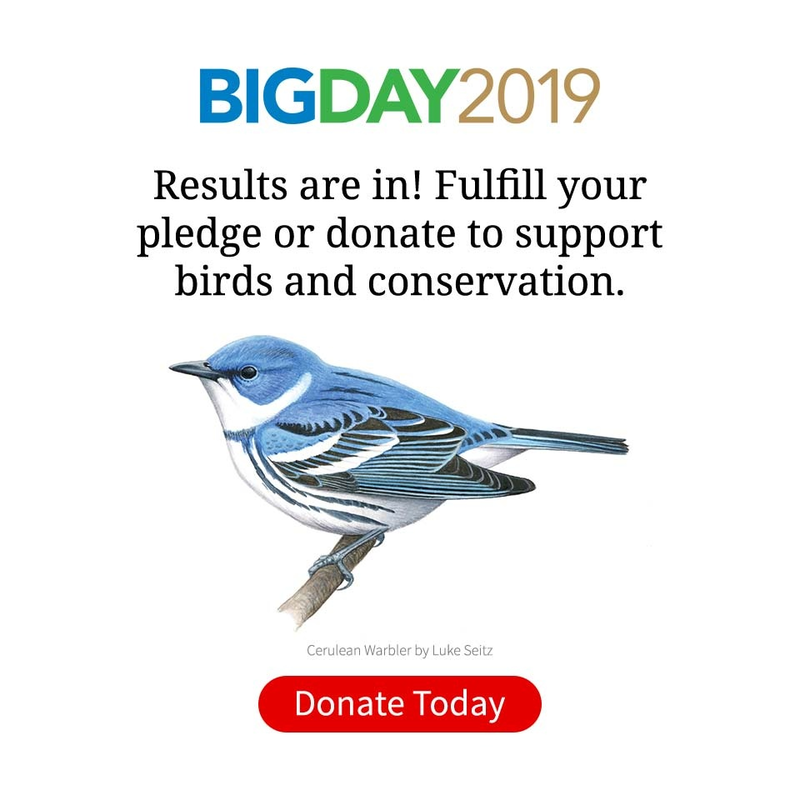 Red-winged Blackbird mobbing other species: with Great Blue Heron, by Larry deWitt; with Red-tailed Hawk, by A wing and a prayer; with Osprey, by Laura M Eppig; with Bald Eagle, by Michelle Lamberson, all via Birdshare. You witnessed a behavior called “mobbing,” where smaller birds swoop and dash at flying or perched larger birds (and sometimes mammals). They typically do this in an effort to drive away potential predators from a breeding territory, a nest or young, or a nonbreeding home range. Common mobbers include chickadees, titmice, kingbirds, blackbirds, grackles, jays, and crows. 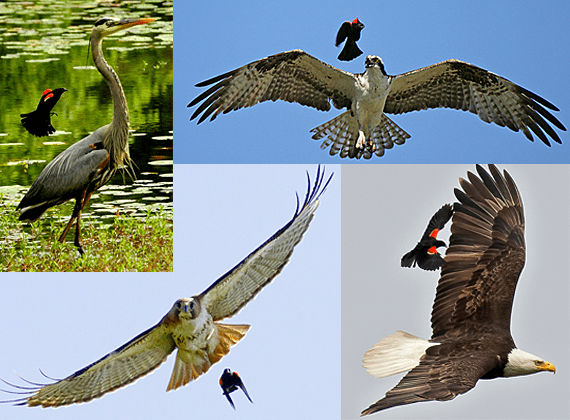 Common targets of mobbing are hawks, crows, ravens, herons, and owls. Mobbing can happen at any time of year, but it is especially common in spring as birds experience surges of hormones, become territorial, and begin to nest. There are different kinds of mobbing. Birds may chase other birds away from their territories or a food source. For example, in the early spring Red-winged Blackbirds chase not only rival blackbirds, but almost any other bird, big or small, that crosses their territory. Mobbing is also used by birds as a way to protect themselves and their young against predators. In these cases you often see a single smaller bird chasing a larger bird in flight (sometimes two or three join the chase as the larger bird crosses territories). In some cases you’ll run across a group of birds harassing a perched predator. Often, several different species join forces to mob this common threat. The mobbing birds tend to use similar-sounding call notes, regardless of their species, and this may act to recruit other individuals to form a mobbing flock. It’s this phenomenon that’s behind the success of pishing, in which a birder imitates mobbing calls to bring birds into view. 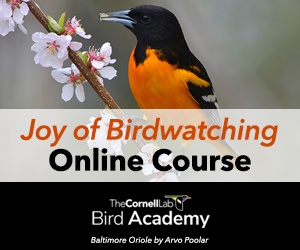 Our Birding Warblers video features a segment on pishing. Mobbing calls may also act as warnings to other small birds, may call in even larger predators to go after the target of the mobbing, and may inform a predator that it has been spotted, causing it to move to another area with unsuspecting prey. Owls in particular elicit intense mobbing behavior, as they often prey on sleeping birds. Smaller birds chase these predators out of their territories so that they will be safer at night. Owls are such frequent targets of mobbing—and so hard to see otherwise—that listening for mobbing calls is a good way to find owls during the day. Mobbing usually does not harm the larger bird, although you may see blackbirds or kingbirds making contact with crows, hawks, or herons as they drive them off. But the behavior is tied more to driving away a predator than causing it injury. At the same time, mobbing is not as dangerous to the smaller birds as it may look, either. The lack of surprise, and the greater maneuverability of the mobber, take away much of the predator’s advantage. When 136 Bird Species Show Up at a Feeder, Which One Wins? Where can I go to watch hawk migration?